SENSITIVE CONTENT FOR THOSE WITH MENTAL HEALTH PROBLEMS. Doki Doki Literature Club! – a seemingly light-hearted and bubbly visual novel that lets players hang out with four incredibly cute girls in a Literature Club after school, which was developed by Team Salvato for approximately two years and eventually released in September, 2017. Although being categorized as Visual Novel on the Steam store page, the game itself has a terrifying twist. After playing for ~ 1.5 hours with casual dialogues and options, it’s gradually disclosed as a Psychological Horror when one of the main characters committed suicide in her own room. For that sole reason, Doki Doki Literature Club! has become one of my most favorite games that I have ever played ever. 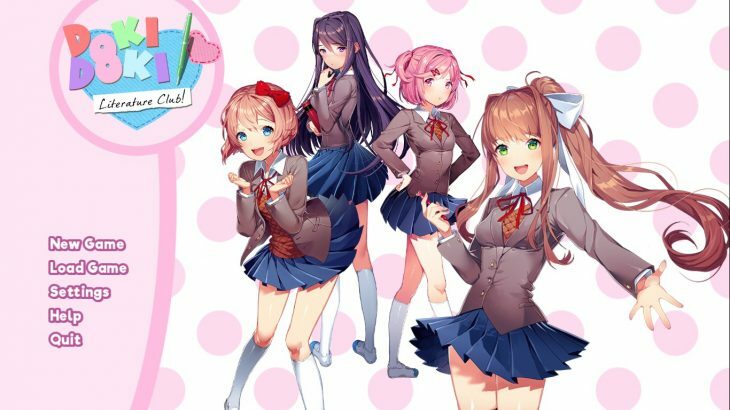 As mentioned, the game started out with the player being introduced to the girls in the Literature Club of their school, each with their own unique personality and features, and their apparent mission is to strive to please one of the girls (which is common in Dating Sims). I did not realize that was I got to do in these kinds of games, thus got my first playthrough all messed up. The second time around, I was being more cautious and considerate and it turned out much better. Everything seemed normal and perhaps even a bit boring at first as the player has to go through lengthy conversations with all of the girls, which makes the poem making scenes surprisingly interesting, although all you do is choosing the words that suit each girl. The twist eventually arrives when one of the girls, whose name is Sayori, opens up about her depression and decided to hang herself shortly after the confession. This is when things begin to get horrifyingly funky. Perhaps the most successful thing that Team Salvato had managed to achieve in Doki Doki Literature Club! is the mind-blowing fourth-wall breaking element. The club president – Monika turns out to be self-aware the whole time, who is, predictably, in love with the player. This being said, she tries to make all the girls unlikable and kill them off one by one. The intriguing thing here is when they die in the game, their character files are deleted as well. Gradually, Monika starts to take over the whole game, including the dialogues, your options and visual effects. The player eventually loses all control and however hard they try, it always ends up with the deaths of all the other girls except for Monika. The game does not truly end until the character file of Monika is deleted as well. Doki Doki Literature Club! is one of the most unexpected games which can leave you empty and traumatised even after weeks of playing. I know I am. Going in blind, I had had multiple goosebumps and chills while playing. The game gets you scared in its own way, not with jump-scares and dark images, but with the deceivingly innocent-looking appearance, which hides numerous gritty backstories behind. This is only part 1, so please stay tuned for part 2 in the following issue next week, as I will tell you even more plot-twists and hidden meanings of this God forbidden game. Goodbye!